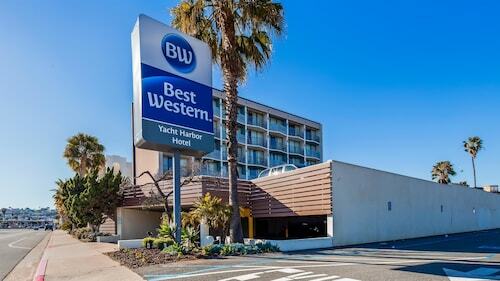 Located in Clairemont, this motel is within 9 mi (15 km) of Westfield UTC, Fashion Valley Mall, and Hotel Circle. University of San Diego and Mission Beach are also within 9 mi (15 km). 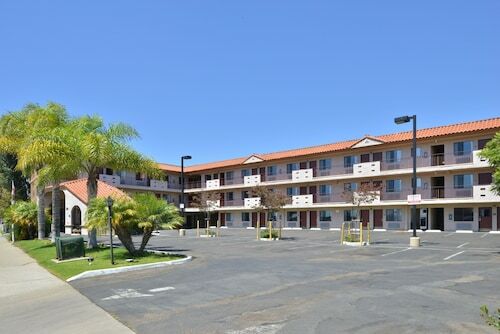 Located in Mission Valley, this motel is within 1 mi (2 km) of Old Town Trolley Tours, Old Town San Diego State Park, and Hotel Circle. Mission Bay and University of San Diego are also within 2 mi (3 km). Old Town Transit Center Station is 7 minutes by foot and San Diego-Old Town Transit Center is 8 minutes. 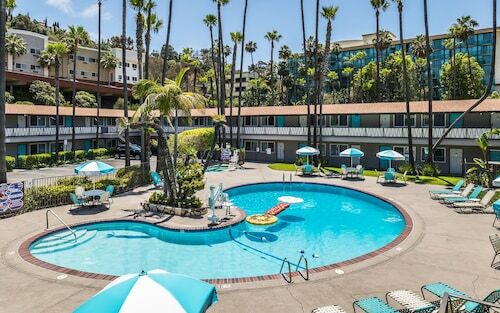 Located in Mission Valley, Kings Inn San Diego - Seaworld - Zoo puts guests close to San Diego hotspots like Little Italy, an 8-minute drive away. Guests can check out world-class local attractions like San Diego Zoo and SeaWorld®, both within a 10-minute drive, and relax on one of the nearby beaches. 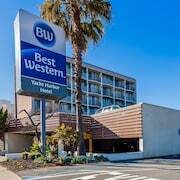 Situated in San Diego, this hotel is 1.6 mi (2.6 km) from Mission Basilica San Diego de Alcala and 2.4 mi (3.9 km) from SDCCU Stadium. San Diego State University and Balboa Park are also within 6 mi (10 km). Grantville Station is 18 minutes by foot. 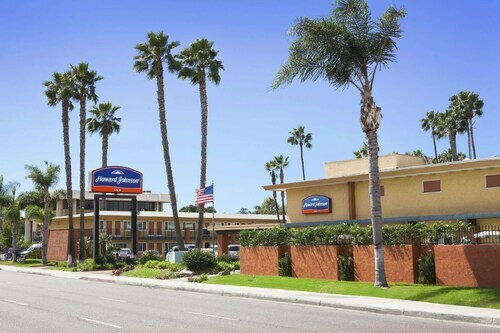 This 3-story Comfort Inn is 3 miles from the San Diego Convention Center and Horton Plaza and within a half-mile of Old Town shops, restaurants, and historic sites. 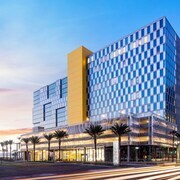 This hotel is in downtown San Diego, next to a San Diego Trolley stop and within one-half mile of the Maritime Museum of San Diego and the Museum of Contemporary Art San Diego. 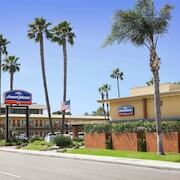 Howard Johnson by Wyndham San Diego Sea World is 2 miles from SeaWorld and the beach, 3 miles from Mission Bay, and 4 miles from downtown San Diego. 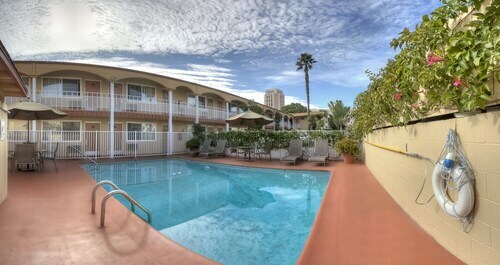 Located in Point Loma, this hotel is within 3 mi (5 km) of Shelter Island, Old Town San Diego State Park, and Harbor Island. Ocean Beach Pier is 2.5 mi (4.1 km) away. 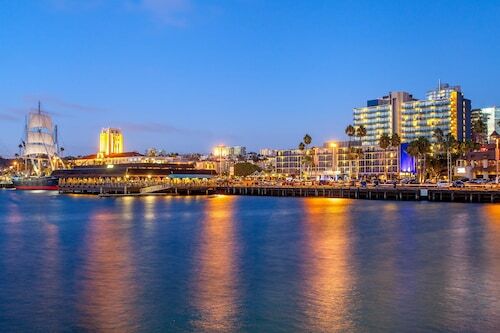 This downtown San Diego hotel is less than a half-mile from the waterfront Maritime Museum and about 1 mile from the San Diego Convention Center and Petco Park. The San Diego Zoo is 2 miles away. 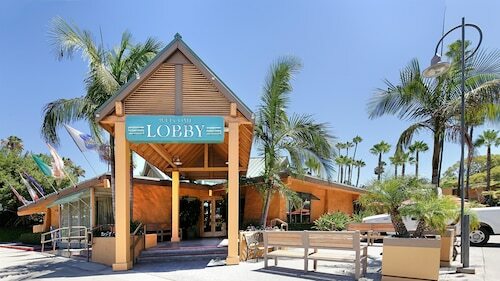 Located in Sorrento Valley, this hotel is 2.6 mi (4.3 km) from Torrey Pines State Reserve and within 6 mi (10 km) of University of California-San Diego and Torrey Pines Golf Course. Black's Beach and Westfield UTC are also within 6 mi (10 km). As your aircraft starts to descend over Montgomery Field Airport (MYF) in America’s Finest City, you will be comforted by the thought that your accommodation is ready and waiting. Welcome to San Diego County! 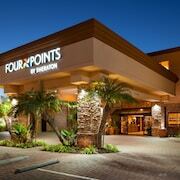 If the prospect of sleeping on the cold floor at the airport isn't appealing, spend an evening at the Four Points by Sheraton San Diego. 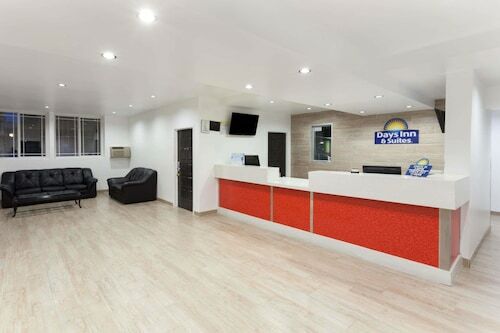 Given there are no hotels next door to the terminal, this nearby property is the best option, and they have complimentary airport shuttle service and 24-hour concierge. For those travelers who aren't fond of staying too close to the airport, there are additional accommodation options available in the nearby neighborhoods. 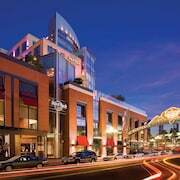 Central San Diego is 1 mile (2 kilometers) away and boasts a decent number of hotels, such as the Residence Inn By Marriott San Diego Central and the Hampton Inn San Diego-Kearny Mesa. 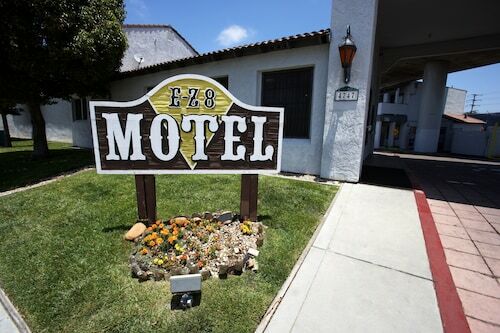 With 35 choices for spending the night, another inviting area is Mission Valley. 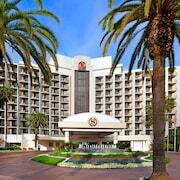 Here you can hit the hay at the Sommerset Suites Hotel or the DoubleTree by Hilton Hotel San Diego - Mission Valley. People travel hundreds of miles for the opportunity to see the San Diego State University. From the terminal, you'll only need to go 5 miles (8 kilometers) to reach it. Can't wait for your next big adventure? 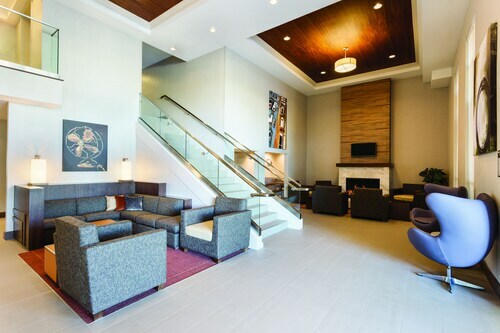 Arrange your Montgomery Field Airport hotel without delay and you'll have one less thing to stress over when you arrive. Good location. Loved the pool and hot tub! Housekeepers were very thorough in their cleaning. Really comfortable bed. Only problem we had was that there was some banging of carts or something during the day. Convenient location, easy parking.